STORY: Amakusa Shirou Tokisada, cause of the calamities occurring worldwide and driven to resurrect the Dark Deity Ambrosia, was slain by a single samurai whose existence was never recorded by history. 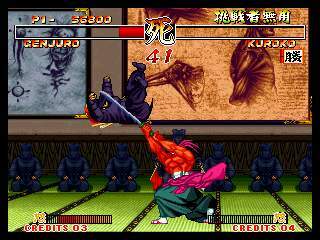 This person deeply involved with the resurrected Amakusa, Haohmaru, was suddenly attacked one night. 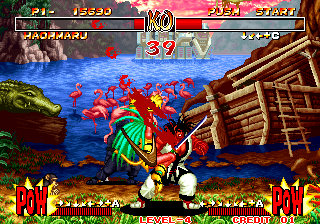 But the one who was up easily defeated was not Haohmaru, but the sinister assailant... Haohmaru's attacker was clearly manipulated by someone or some evil force. 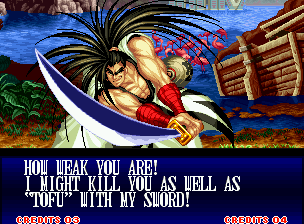 The would-be assassin gasps a final promise to Haohmaru. "I'll have your soul one day.... Ambrosia...lives." The evil ones are after him! 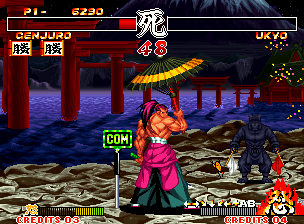 Haohmaru, sensing an evil force rivaling Amakusa, pays a visit on his old fencing master. 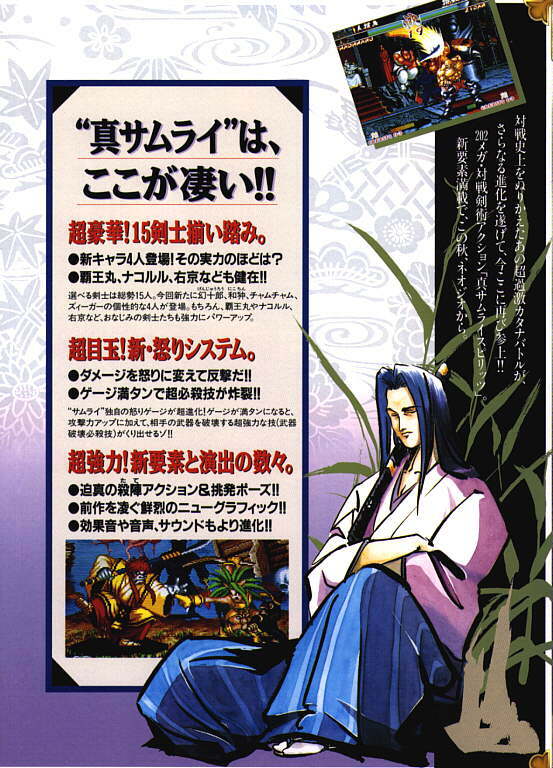 While Haohmaru relates his story, his master's visage grows unusually grim. "Stay away. You have undeniably grown stronger. But you must not confront them. Do you understand?" His master obviously knows more, but grows silent, and besides Haohmaru isn't listening anyway. 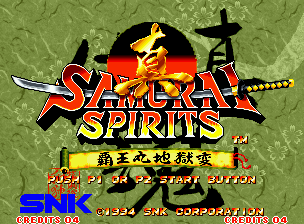 That night, they share a few drinks to celebrate their reunion after a long separation, and at dawn Haohmaru slips out unannounced to embark on his journey. An audacious smile plays on his lips. An awesome line-up of weapon-wielding warriors. 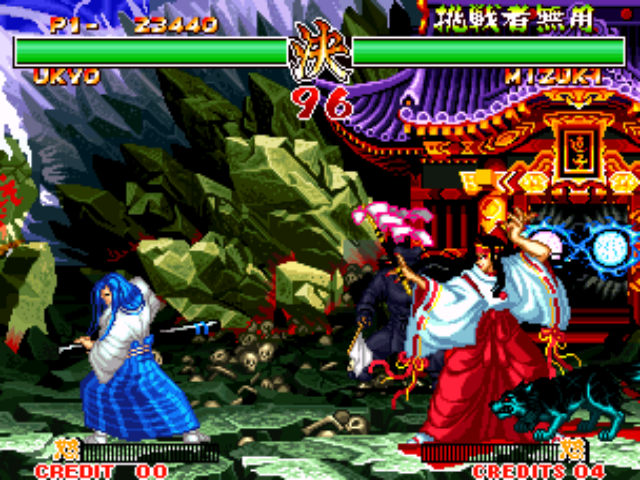 REVIEW: Samurai Shodown II (known as Shin Samurai Spirits: Haohmaru Jingokuhen in Japan - which translates to True Samurai Spirits: Haohmaru's Portrait of Hell), is the arcade sequel to the hit 2D weapon-based fighting game by SNK. 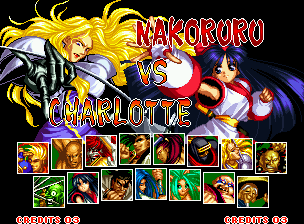 This installment presents updated character and background graphics, featuring completely re-drawn 2D sprites with brand new animations (something that Capcom wasn't doing with the SF2 series). 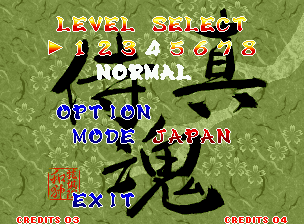 Actually, nearly everything in SS2 shines with "newness," including the stylish character selection screen, amazing in-your-face artwork, moody background music, and brand new gameplay systems. 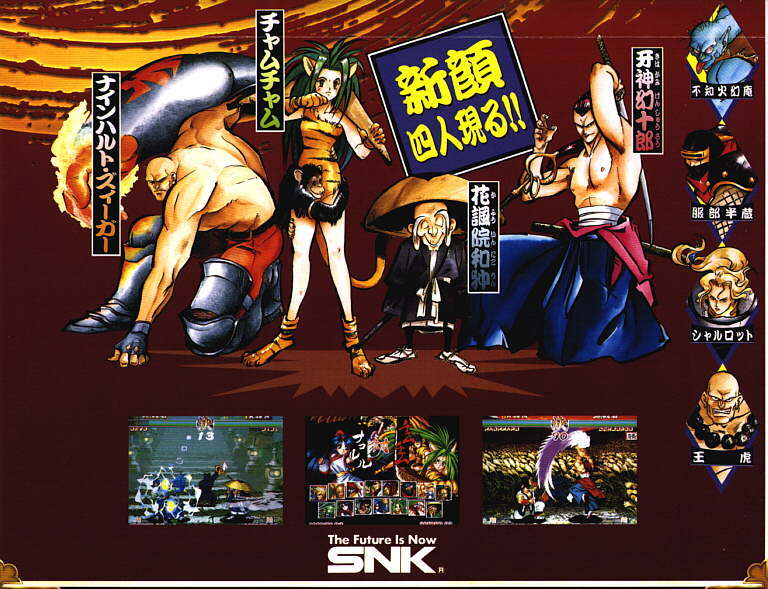 SNK wasn't messing around in late '94... that's for sure! 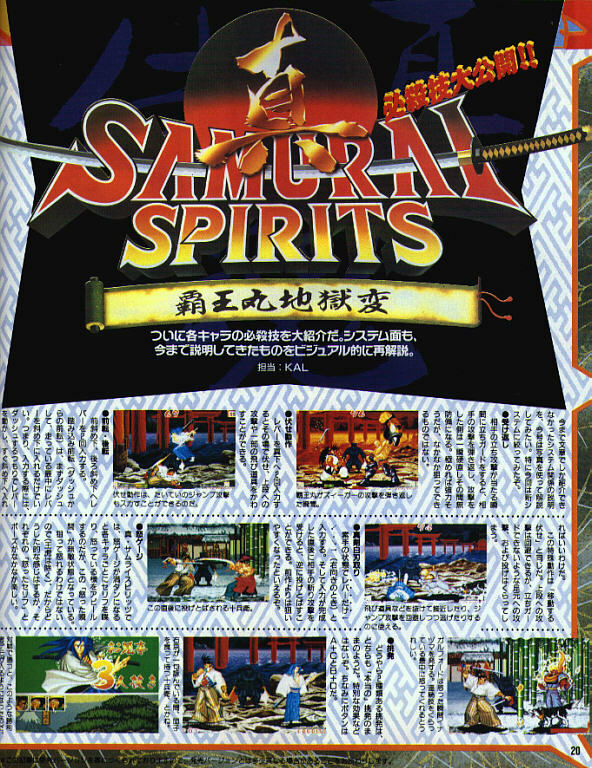 In 1994, the competition within the fighting genre was downright fierce... but Samurai Shodown 2 came prepared for a battle to the death! There seems to be a "reason" behind every minute detail in the game, and sometimes it takes a keen eye to notice all of these details. 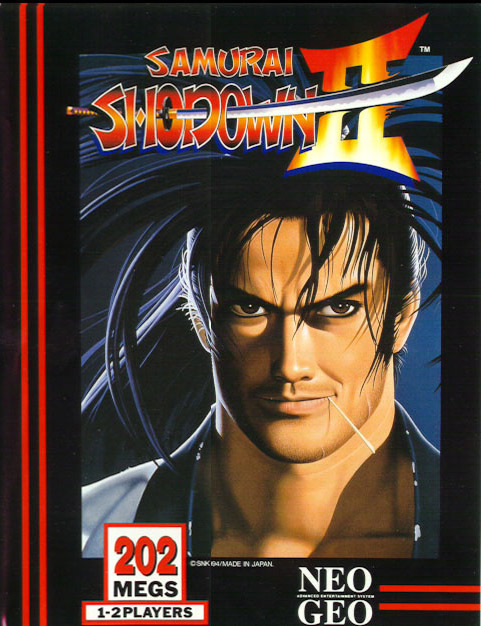 With headlining blockbusters like Mortal Kombat 2, Super Street Fighter 2 Turbo and X-Men: Children of the Atom... it wouldn't have been a surprise for a gamer to have skipped over the brilliance of Samurai Shodown 2, but they certainly would've been missing out on one of the best fighting games known to man. 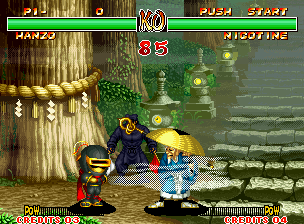 "Caffuiiiiene Nicotine VS Kibagami Gen-ju-ro!" 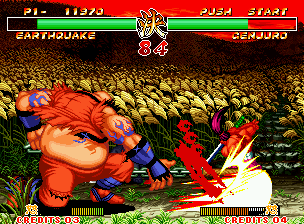 A Weapon Break occurs immediately after a successful Super Move. 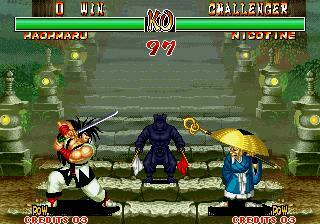 The character hit with the Super Move will lose their weapon for a brief period of time, forced to fight unarmed. 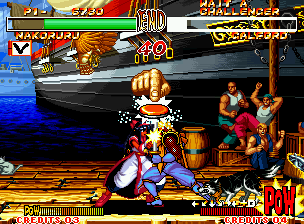 Skilled players can still hold their own when fighting barehanded, and even "catch" an opponents weapon barehanded... but characters will take severe guard damage when blocking without their weapon. If they can survive, a character's lost weapon will return in about 5 seconds, but the character still has to pick it up (even more strategy involved). Weapon Breaks really "make the game" if you ask me, potentially adding an insane amount of drama to the battle. 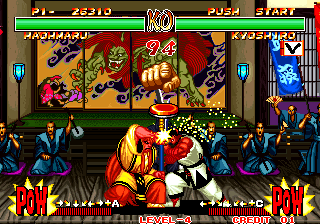 Just like in Street Fighter 2, air blocking doesn't exist, so players will experience good-old "anti-air mind games"... and due to the captivating projectile "variety" of the characters, there are plenty of epic and fun projectile wars (and strategies) to be had. 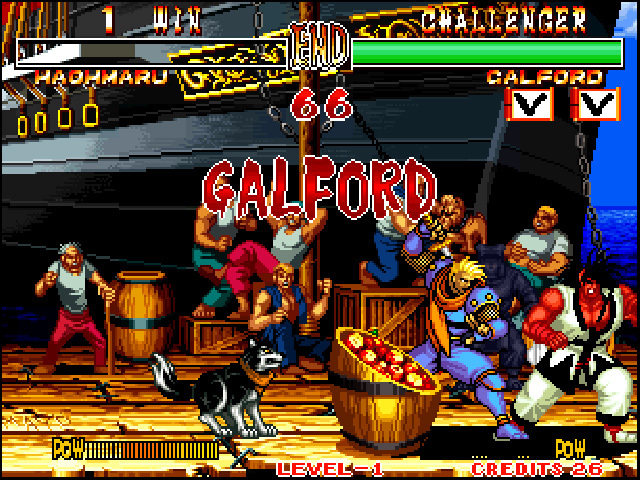 Every character in the game has their clear strengths & weaknesses, and each of them can definitely be used effectively. 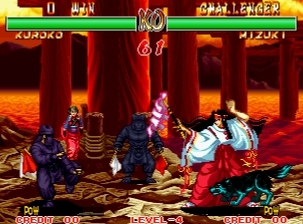 As in the first game, the animation becomes delayed (AKA slow motion) when powerful attacks connect, which actually effects gameplay and the timing of combos... plus it looks really really cool. 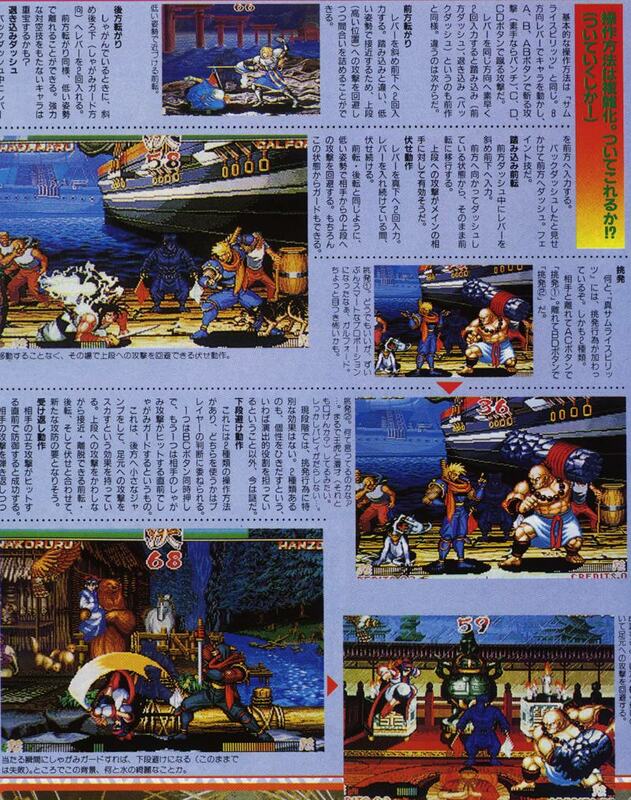 On that note, when compared to other 2D fighters, some may think SS2 is "slow"... but I would disagree. 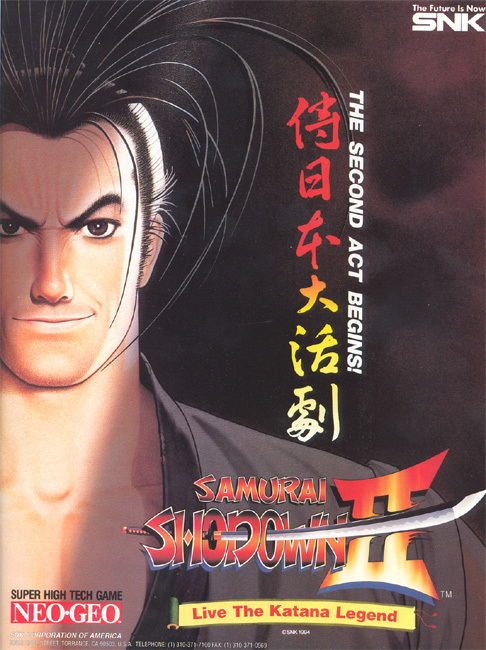 The prolonged jumps and delayed hit confirms (as I'll call them), only add more gameplay options and give SS2 a very unique pace" No other fighting game at the time felt like Samurai Shodown 2, in large due to its steady pace. 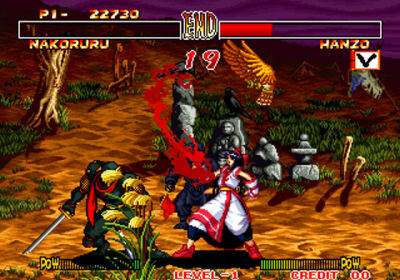 Stylish samurai battles... to the death. The Rage system once again adds a strategic (and unforgiving) element to the core gameplay. 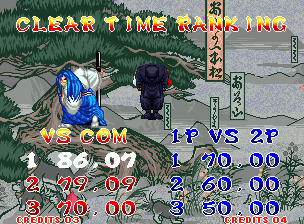 Landing a single attack in Rage Mode, at the right time, could potentially take off 50-60% life in Samurai Shodown 2. 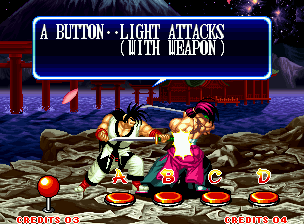 In addition to dealing greater damage when the Rage Meter (A.K.A. POW Meter) is full, Power Special Moves can now be performed when the meter is at 100%, and most of which look nothing short of spectacular when they connect. 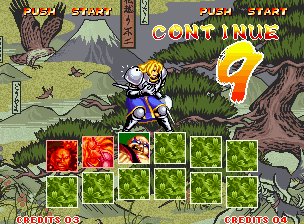 Also, commands for Power Special Moves are conveniently shown about the Rage Meter when they're able to be performed... nice touch SNK! 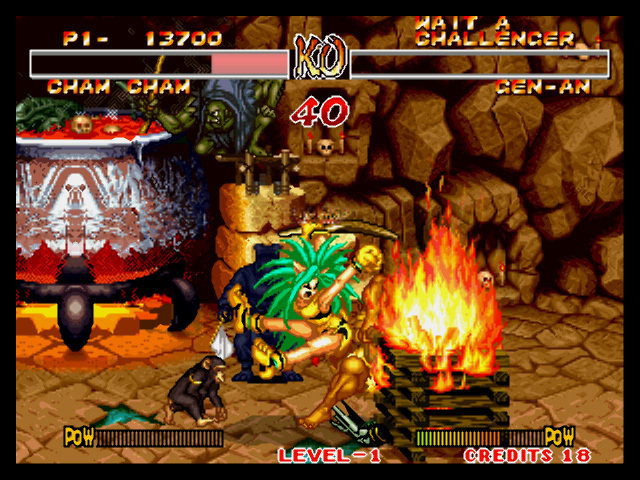 SS2's Rage Mode is one of the earliest "comeback mechanics" ever to appear in a fighting game, as the tide of the battle can turn at any time. 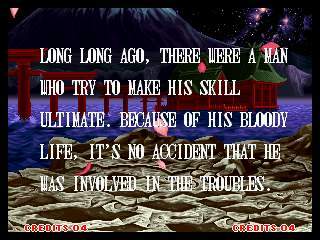 A skilled player can literally win against a full-life opponent with a 3 or 4 hit combo, while in Rage. 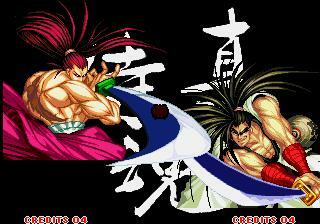 (And considering these warriors are using razor sharp blades and dangerous weapons, you kind of have to respect that!) Dizzies can also occur pretty randomly, adding even more potential ways to make epic comebacks. 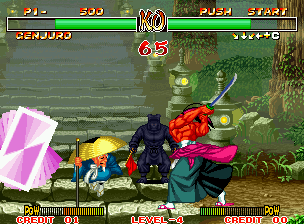 In addition to a near-perfect traditional 2D fighting game formula, SS2 even features quite a few "hidden" gameplay nuances, such as taunting (and taunt canceling, too). Every character has 2 different taunts, which can be canceled with a normal, special, or super move (it's strategic I tell you)! Ohh, and if you taunt the CPU AI, it taunts you back... how epic is that? Also worth noting is that these are not ridiculous or senseless taunts... they make sense, flowing with the pace of battle, and bring out each character's personality onscreen. 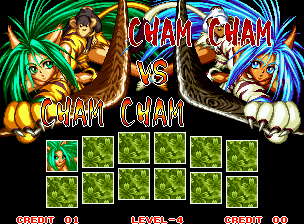 SNK also included a random funny Easter egg where characters can quickly turn into "chibi" versions of themselves during gameplay, then quickly change back. 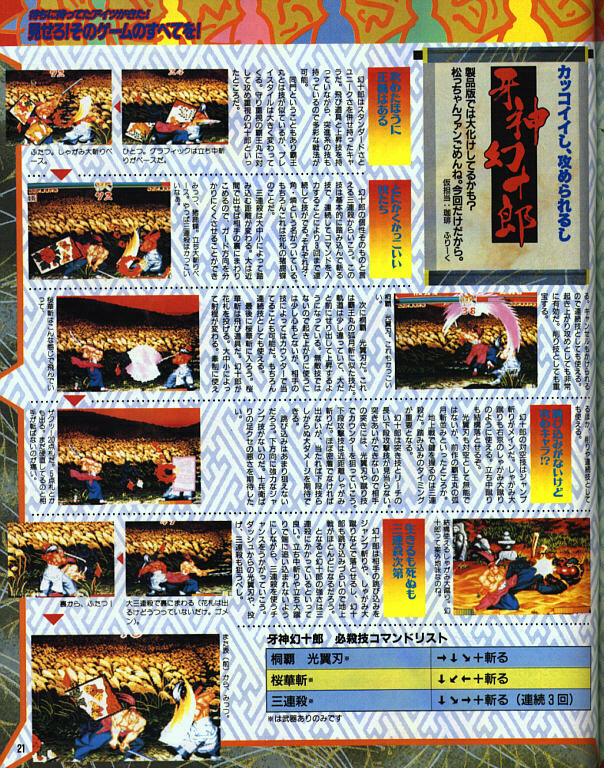 Another fan-favorite secret of SS2: Kuroko (the ref) will jump into battle and challenge the player randomly during an arcade play-though. 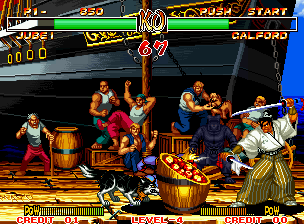 Like in the prequel, random "buff" dudes will commonly run onscreen and throw food and/or bombs, which again can change the pace of battle (but still offer a strategic element to the gameplay)! 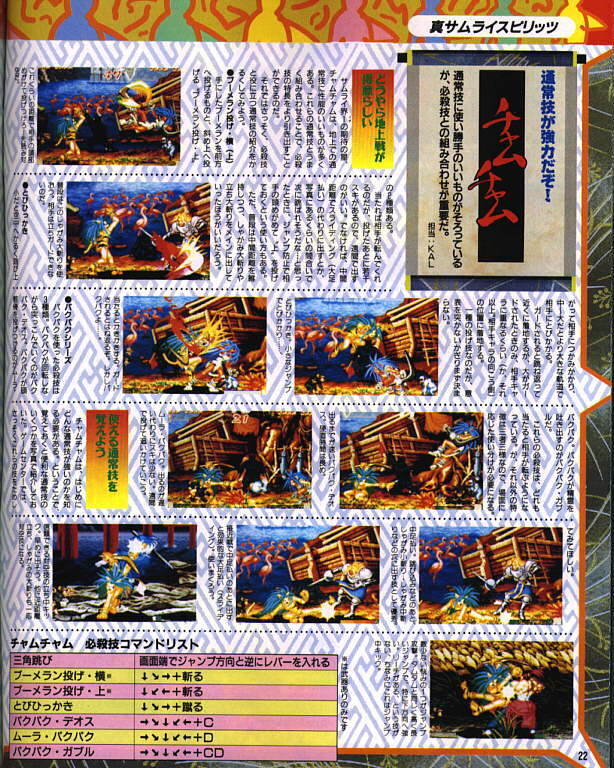 There's even a parrying system in SS2, as blocking at the last possible moment will cause the attacker to freeze for a few seconds. 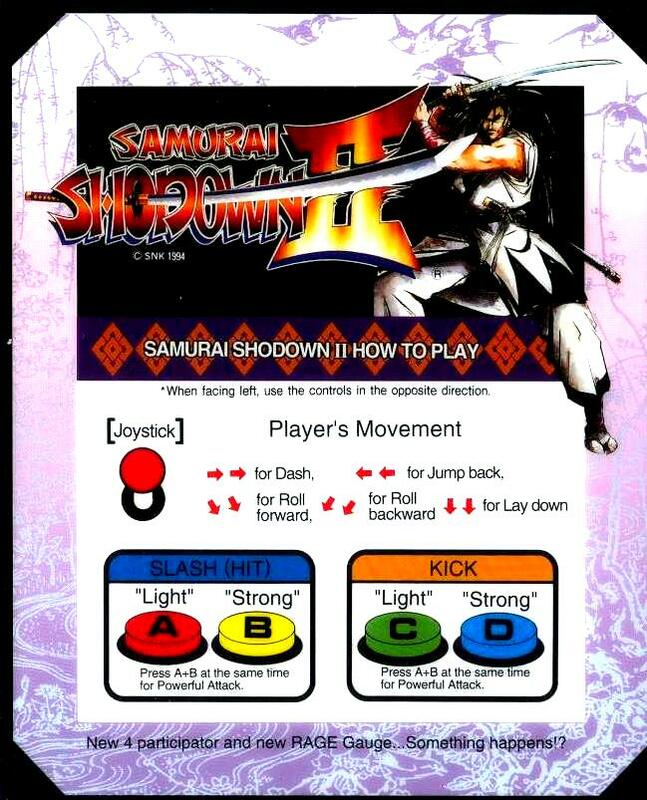 All of these systems and "hidden" elements to the gameplay come together beautifully to make Samurai Shodown 2 a truly "standout" fighting game. 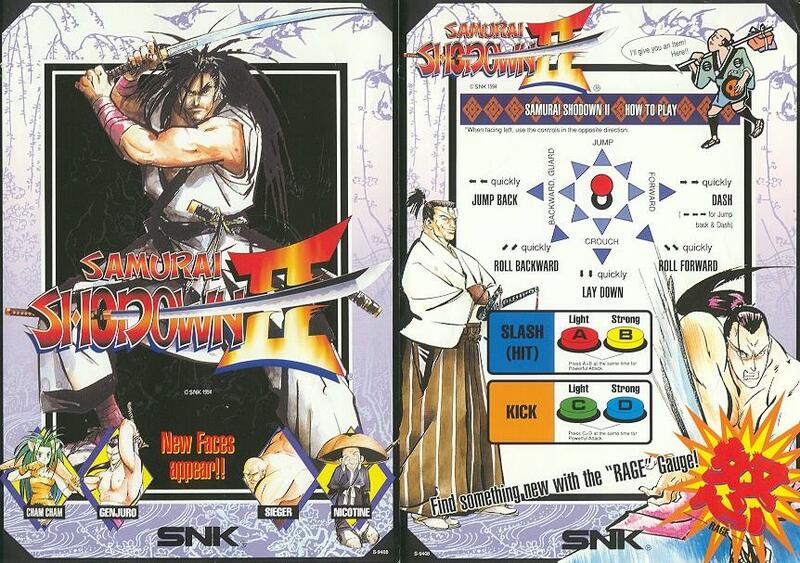 The visual presentation of Samurai Shodown 2 is rivaled by very few other fighting games of the era. Everything about the game is just so damn epic. 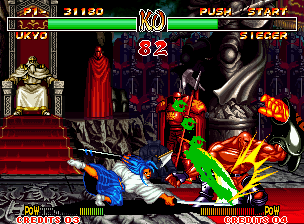 Like in the prequel, a well placed finishing strike at the end of a battle can split your opponent in half, or even give the winning fighter a shower in their opponent's blood.... Beautiful stuff. 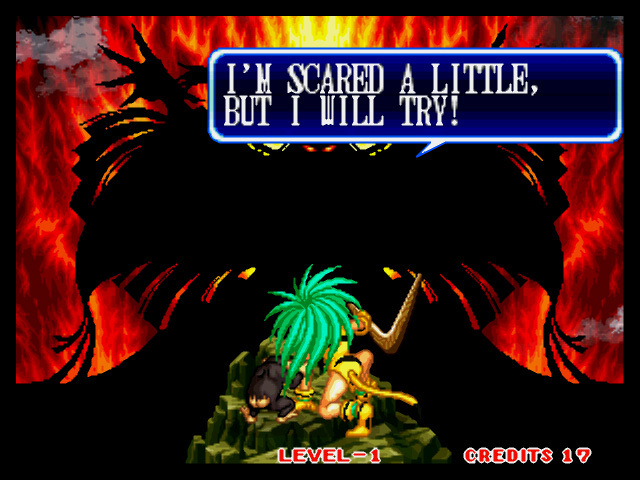 Not only does SS2 play like a gem, but the art style and distinctive "mood" of SS2 is beautiful, inspiring, and simply badass. 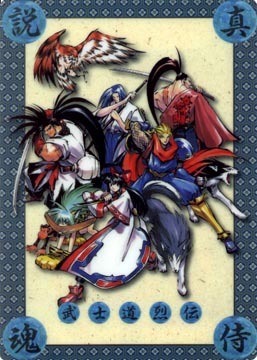 From the charismatic character designs and brilliant artwork, to the lively music & sound effects, to the unforgettable voice acting & charismatic narrator, to the elaborately designed, gorgeous hand-drawn backgrounds (and interactive background elements) that place you right into the heart of ancient Japan. 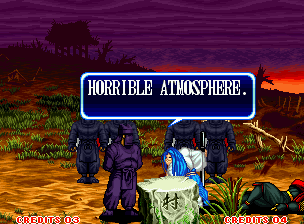 Samurai Shodown II is a work of art. 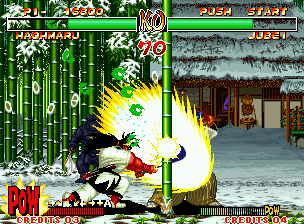 At the time of its release, Samurai Shodown 2 raised the bar on so many fronts, not only attempting things never before seen in a fighting game... but succeeding with flying colors. 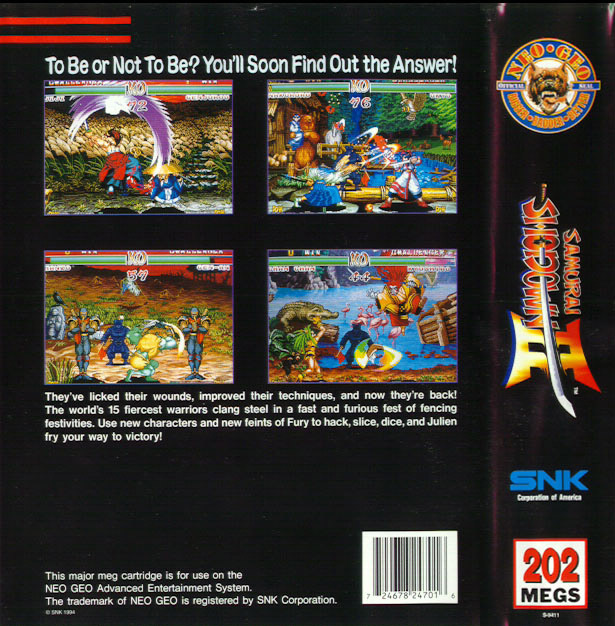 SS2 is remarkable, innovative, and incredibly polished fighting game that truly marches to the beat of its own drum. 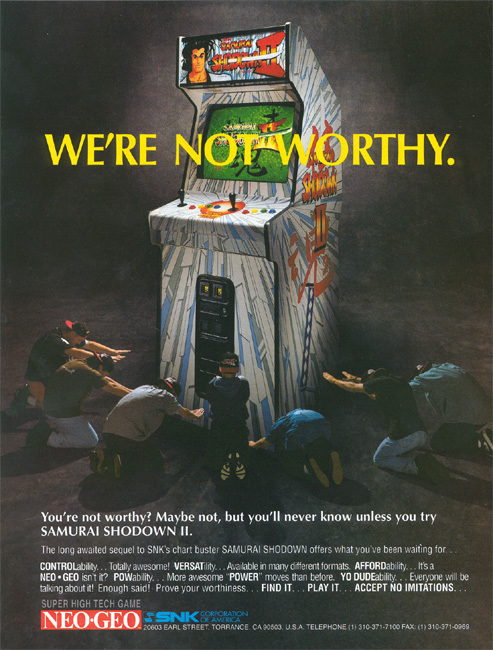 The memorable characters, backgrounds, music, and the intense, yet classy & stylish samurai battles to the death are simply unforgettable (especially for those of us who played it at arcades in the mid 90's, when it was nothing short of revolutionary). 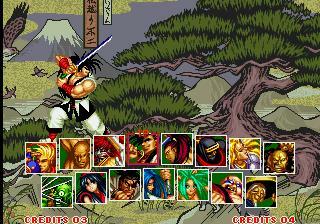 On a personal note, Samurai Shodown 2 is easily on my "TOP 3" favorite fighting games of all time. 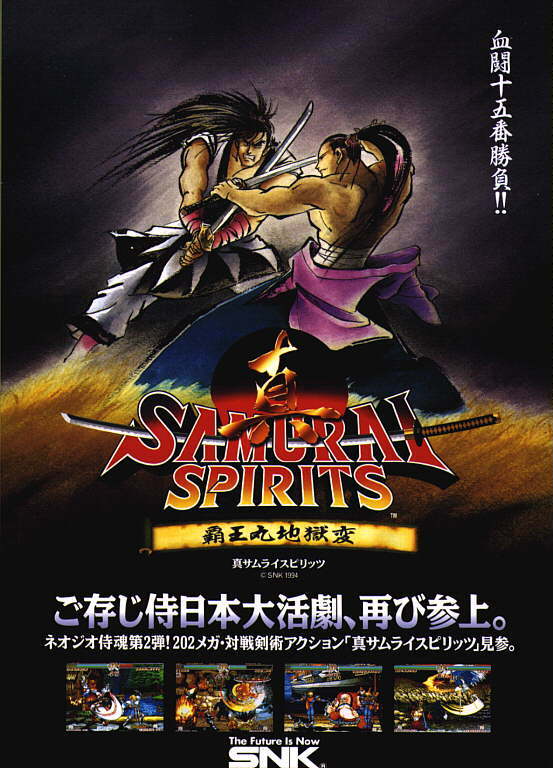 I was racking up win streaks in this game in 1995 when I was 12 years old, and I can still play a deadly Genjuro (and Earthquake, Ukyo & Galford) after all these years.... Doriyaaah! Seriously, the characters are just so damn fun to play in this game. 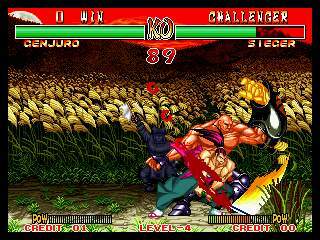 What more could you want out of a fighting game in '94-'95, or now even? 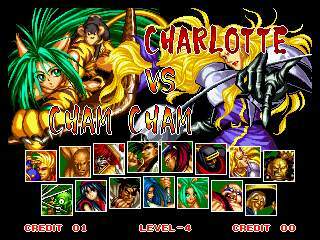 Because if a fighting game was ever balanced, you're looking at it... every character in the game can destroy opponents (with so much style) under the control of a skilled player. 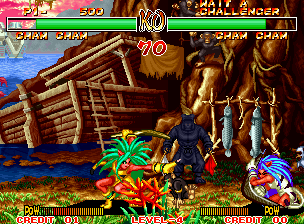 Some might think the damage in SS2 is a bit too drastic, but it's not unreasonable considering the subject matter (we're fighting with bladed weapons here). The high damage output and Rage mode also enables the possibility of epic, (and usually fair) comebacks. 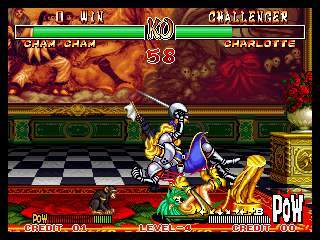 Also worth mentioning is that the CPU AI is particularly challenging in Samurai Shodown 2 on its default arcade setting... but in a good way. If you're not careful against the computer, it'll cut you in two with no mercy!